Nobody knows when plague appeared. Experts say that plague pestholes still exist in remote parts of Central Asia and some South African countries, Namibia, Angola and South African Republic. And supposedly, the disease had its sources right on these territories. Long ago researchers determined that the plague bacillus lives in organisms of wild rodents and is carried by fleas. But it was just in the mid-1980s that researchers managed to say how an epidemic breaks out. As it turned out, plague pandemic breaks out because of drought. Hungry, weak and diseased rodents abandon their native places in search of food and thus spread plague over vast territories. Sooner or later they reach human habitation. Fleas infected with plague bacilli cling to domestic rodents for which plague turns to be fatal. Then, fleas jump on dogs, cats and humans. This exchange of the infection is particularly dangerous for people. Just few percent of diseased people survived in the epochs when mankind knew no insecticides or antibiotics. It is believed that the first plague epidemic that left reliable evidence broke out in the 12th century B.C. Old Testament mentions mice that spoiled the ground. Another plague epidemic gripped all countries of the civilized world and thus was called a pandemic; it came to the Upper Nile from Central Africa in 541. The plague killed thousands of people and reached Alexandria of Egypt, a busy port where tens of merchant vessels dropped anchor every day. Alexandria granaries were packed with grain and certainly there were flocks of rats. This fact predetermined the history of Europe for many centuries ahead. For less than a year plague reached Constantinople where 10,000 people died every day at the epidemic peak. Plague made the Byzantine Empire vulnerable to aggressive neighbors and became the reason of its subsequent extinction. For over 200 years plague raged in the Mediterranean countries and claimed lives of at least 45 million people. Fourteen outbursts of plague on vast territories were registered over the period. But then plague mysteriously disappeared all of a sudden. So, when plague reappeared in 1346 people did not remember the fatal disease and believed they were facing the doomsday. By the middle of the 14th century the commercial routes along the Asian continent were very busy. In the early 1320s, an epidemic broke out in Central Asia and then spread eastwards, to the ultimate borders of China. In that period China was already the most densely populated country on the planet; plague speedily devoured a province after province. Sometimes there were no eyewitnesses alive to tell how many people actually died because of plague. From Central Asia plague began spreading westwards together with merchant caravans. In 1346, plague reached the Caspian Sea and the Black Sea shores. Galleys with exotic goods came to Istanbul from Kaffa (now Feodosia) and brought plague there. 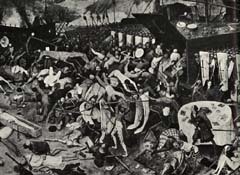 The Moslem world got first infected with plague in 1348 and was suffering from recurring outbursts of the disease until the end of the 19th century. Plague came to Western Europe through the port of Smirna, Sicily. The disease exterminated entire crews of vessels coming from the East. Merchants were anxious about the great number of dead people and had no notion that the disease spread because of dead rats scattered here and there. Goods from the port were distributed all about the continent through Marcel and Genoa thus also spreading plague. The subsequent five years were terribly disastrous and went down in history as the Black Death period. People infected with plague had painful bubo in groins and underarms. Majority of patients died of plague within five days; when the infection got into lungs together with blood patients died even quicker, in three days. Plague was so rampant that there was no time to dig graves or make coffins for all victims. Special teams of volunteers collected dead bodies and piled them in what was called plague ditches. It was particularly scary that people still failed to determine the source of the disaster. People sought to blame others, and xenophobia was the norm, scapegoating was popular. Jews were suspected of poisoning wells even though they died of plague as often as others. The church faggoted several women suspected of witchcraft but the situation did not change. Clergy believed that plague was a severe penalty for people's sins and warned the doomsday was approaching. Doctors of the University of Paris stated that the disease was caused by unfavorable arrangement of planets. People believed that plague was carried with miasmas, that is why many people went out of homes with their faces buried in bunches of flowers. They hoped that flower aroma would keep them safe from the disease. Soon, people noticed that the disease spread quicker in the density and mud of big cities. Many people did not change their clothes and took no bath for months. Having killed over 25 million people, plague seriously transformed the European society. It took 200 years to restore the previous population there. The third pandemic of plague raged within 1894 –1910. The disease made a round-the-world voyage thanks to transport. Plague hit countries and continents that had never known the disease before, Australia, Japan, South Africa and both Americas. In 1894, Alexandre Yersin in a small hospital in Hong Kong examined the dead bodies of people killed by plague and found out “little bacilli with rounded ends” in their ulcers. At the very beginning of the pandemic six million people died of plague in India. Doctor P.L.Simond studied dead rats in a laboratory in Bombay and discovered that every rat carried plague bacilli and a huge number of fleas. The doctor said the fleas readily bit humans as well. So, the centuries-old secret of plague was solved. Thanks to efforts of a great number of doctors and researchers the Black Death retreated. In the 1930s, pharmacists invented effective sulfa medications to treat plague and effective antibiotics against the disease appeared in the 1940s. But still today researchers would not state that plague is defeated once and for all. It is difficult to diagnose plague at once as its initial stage resembles flu or any other virus infection. Tens of thousands of plague patients are registered worldwide every year; not more than 3-4 percent of cases are fatal today. But it is not ruled out that the ancient disease may break out if another world war begins or a large-scale cataclysm breaks the habitual course of life.